In the Powder River Basin, coal companies are pushing to unlock more carbon pollution each year than the Keystone KL pipeline. As the pending decision on the Keystone XL pipeline dominates the climate focus in the United States, an even bigger carbon bomb is ticking quietly in a remote region of the American West. Big Coal and Republican lawmakers are pushing to expand mining operations on federal lands in the Powder River Basin, which straddles eastern Montana and Wyoming and holds the bulk of the country’s coal stocks. 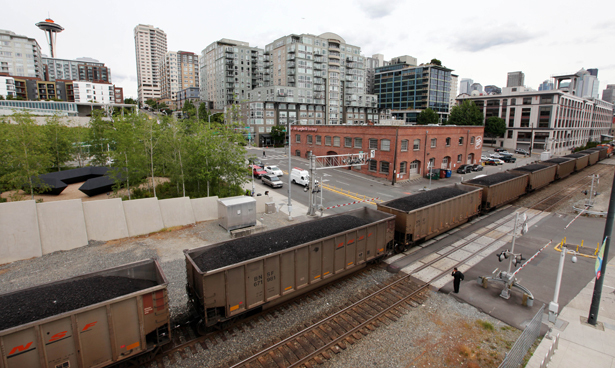 If they’re successful, railways in the Pacific Northwest will soon transport an annual cargo bound for Asian markets that amounts to more than 200 million metric tons of carbon dioxide. For comparison, projections for Keystone XL see emissions increasing by about 181 million metric tons per year. If, as President Obama said in his climate speech, it isn’t in the national interest to significantly increase carbon pollution, keeping PRB coal in the ground should be a priority. But his administration has continued to give Big Coal access to the PRB, and has not addressed the proposal to radically expand mining from a climate perspective. In Congress, scrutiny of the project has focused on the leasing program, which has been corrupt for decades and cheats taxpayers out of tens of millions. Senators Ron Wyden and Lisa Murkowski called for an investigation earlier this year, and the Bureau of Land Management says a task force is reviewing how the agency values PRB land. Ensuring that taxpayers are duly paid for a massive increase in dirty energy production is a small start, however. Also on Tuesday, hundreds in Portland, Oregon, turned up at a permit hearing for one critical part of the export project, a rail terminal proposed by Ambre Energy at the Port of Morrow in Boardman. Six of these export terminals have been put forward in Oregon and Washington; three were shelved after public outcry, and now coal companies are desperate to win approval for the final three. If they do, US coal exports would double, crippling efforts to get both the US and developing countries off dirty energy by lowering the price of coal and discouraging investment in renewable technology. Hundreds of coal-laden trains would rumble alongside the Columbia River and through western towns each year, spreading up to a ton of coal dust per rail car. This push to make the Northwest the nation’s top coal-producing region is the last gasp of Big Coal. With domestic and European consumption falling, the industry’s future hinges on consumers across the Pacific, namely China and India. More than 40 percent of US coal lies in the PRB, but with ports lying mainly on the East Coast and the Gulf there is no fast track to get it to market. For that and other reasons PRB isn’t the sure economic bet the industry would have you believe. “Anyone who believes there’s some great new bonanza in coal is in deep denial,” Huffman said. “Coal is not a good long-term investment for any state or any community.” Other than the Crow lands, most of the PRB is federally owned, so it’s up to the Obama administration to decide how much mining to allow. Claims about job creation are vague, while massive increases in rail traffic and pollution could damage waterways and other sectors of the economy, namely agriculture and ranching. Still, it would be a mistake to underestimate the industry’s clout. Even without the proposed terminals US exports doubled last year, and the Energy Information Administration projects that coal, which has the highest greenhouse gas content of any fuel, could come close to surpassing oil as the world’s top energy source by 2017. “If it’s been a war on coal, it’s been a pretty ineffective one,” said Huffman, noting that the Obama administration approved more leases in the PRB in the first term than Bush did in his. One of the most significant oversights in the case of the PRB is the Army Corps of Engineers’ decision not to undertake a comprehensive environmental review of the export pathway. “Many of the activities of concern to the public, such as rail traffic, coal mining, shipping coal outside of U.S. territory and the ultimate burning of coal overseas, are outside the corps’ control and responsibility for the permit applications related to the proposed projects,” acting regulatory chief Jennifer Moyer said last month before another House committee. If Obama is serious about his climate plan and the national interest, he should order up that review. Oregon and Washington’s governors have both called on the Feds for a comprehensive assessment. In April, 21 environmental organizations sent a letter to newly appointed Secretary of the Interior Sally Jewell asking for both a review and a moratorium on new leases. Activists are doing their part, with community groups, environmental organizations, ranchers and local politicians organizing to block the terminals. In some ways this fight is less daunting than Keystone, since most PRB coal is owned by taxpayers and it’s clear that there aren’t options for getting massive quantities of it to Asia without new terminals. State officials can drag out the permitting process, as they have already done. The debate could stimulate a serious conversation about how to reinvigorate traditionally extraction-dependent communities in the West, an issue far greater than the PRB. But first, Washington will have to step up.